Many NARHA items are being offered at closeout prices at Equestrian Collections.com, including polo shirts, sweatshirts, window decals, and padfolios. Discounts of at least 30% are offered. Visit the store to see all the items! NARHA's annual nomination process for region representatives is under way. This year nominations are being accepted for odd-numbered regions: 1, 3, 5, 7, 9 and 11. NARHA Region Representatives serve as ambassadors for the association and NARHA membership including recruiting, retaining and recognizing members; collaborating with groups in and outside of NARHA that can positively impact the success of NARHA members; leading NARHA recognition of center and individual members and participants; and helping to coordinate states, regions and NARHA communities into effective networking systems. · Be a NARHA member for at least two years prior to nomination with the exception that if the member expresses a strong interest in assisting and supporting NARHA and has already taken steps to do so, and that individual receives a recommendation from the current region representative and support from the region membership. · Have a strong interest in assisting and supporting NARHA's development and growth. · Is a resident within the region represented. · Is encouraged to represent and serve as a voice for one or more of the diverse communities in NARHA. · Is willing to be an advocate for members' success. · Is committed to active participation in volunteer activities. · Has access to email and other electronic support for communication ease. Click here for a nomination form. Please have all nominations to your current region representative no later than June 1. The ballot for voting will be available in July. 5. Professionals in the medical, pharmaceutical or rehabilitation industries. Please help by submitting names of prospective board members who you believe would be an asset to NARHA. Click here for the board job description and an application. Candidates should also include their resume. Names should be submitted to the Governance Committee by May 15, 2011. This is the last week to register for the NARHA Region 9 conference. The region 9 conference will go on as planned. You will not want to miss this event as you spend time with friends and colleagues while you also acquire your continuing education hours. Registration will be open through May 6th so register now. Click here to download a registration form and email or fax it back to Jaime Covington at (303) 252-4610. Or you can register online. 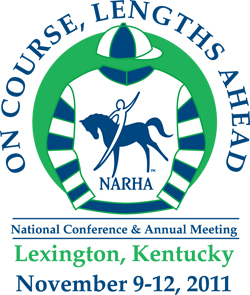 Save the date, July 29-31, for the upcoming NARHA Region 7 conference. Don't miss this event! Spend time with friends and colleagues while you also acquire continuing education. Registration will be open soon so look for information to be coming to you via email. You can also check the regional conference section of our website. We know that many areas of the United States have recently been hit with severe storms and tornadoes. Our thoughts and prayers go out to those who have been affected. It can be difficult to determine how much weight a horse can comfortably carry. We know to consider age, breed and physical condition. There is also the well-known statistic of horses being able to carry 20 percent of their body weight for tack and rider. However, another big consideration is the rider's physical ability. The feel of the weight the horse receives can differ greatly when you compare a rider with good balance and correct posture who supports herself, with a rider who does not. A large, well-balanced rider can be easier to carry than a smaller, ill-balanced rider. A couple of analogies may help with this. For example, consider the 40 pound dog that turns into 80 pounds when you carry him toward a tub full of water. It's a pretty amazing transformation. Not only does he feel heavier, but the difficulty increases when he begins to squirm and struggle. You may feel like you need four arms and a lot more muscle to get the job done. Another analogy is the act of lifting and carrying a child. The willing and/or awake child reaches up to you. Effortlessly, you swing them up and onto your hip. Compare lifting and carrying that same child while asleep or in full-blown temper tantrum mode. One supports his own weight and maintains his own balance. The other does not support his own weight and may also be creating additional movement. Even though the actual weight has not changed, the feeling of the weight you carry is very different. In therapeutic riding situations, instructors often deal with students who are unable to support themselves and who struggle with balance. This puts an extra burden on the horse. It is important to consider this when determining the right horse for the job. Honor for ALL will be hosting "Visible Honor for Invisible Wounds," a rally to commemorate the first anniversary of National Posttraumatic Stress Disorder Awareness Day as well as promote awareness of PTSD and its effects on our veterans and society in general. The event will be Saturday, June 25, 10 a.m., at Upper Senate Park, US Capitol Grounds in Washington, DC. Any combat veteran or representative of a combat veteran having received a wound, visible or invisible, as a result of participation in armed conflict in defense of our nation may receive VIP passes by contacting Karen Ann Grey: k.a.grey@iup.edu, at Honor for ALL. Click here for information about Honor for ALL. The IRS will soon release the first Nonfiler Revocation List, identifying nonprofits whose tax-exempt status has been revoked for failure to file an annual return. Even if your organization is not on the list, the revocations could affect you. As many as 321,000 nonprofits may appear on the Nonfiler list. Anything affecting that many organizations has the potential to have broad impact throughout the nonprofit sector. Download "What Automatic Revocation of Nonprofit Tax Exemptions Means for You: A Review for Nonprofits, Grantmakers, and Donors" to learn more. lists resources where readers can get more information. If you are interested in attending, please call the center immediately as they need more people to sign up in order to hold this event. If you wish to attend, please call the center and get your spot paid for!